If you ask someone to name a country they associate with whisky, they'll likely name Scotland or the United States. If they're a bit more knowledgeable or enthusiastic about whisky, they might say Ireland, Canada, or Japan. How many people would identify India as an amazing whisky-producing nation? Probably not many. It's understandable; Scotland and the United States have terrific marketing for their whiskies. Single malt scotch and bourbon have scores of loyal followers, Facebook groups and Instagram accounts dedicated to them. If you ask people in North America what they associate with India, most will probably allude to Bollywood, spicy cuisine, bright clothing, Gandhi, or Hinduism. For most North Americans, India is perceived (rightly or wrongly) as mysterious or exotic. But India is a burgeoning economic power. It is the world's sixth-largest economy by nominal GDP and the third-largest by purchasing power parity. It is also home to some of the most interesting single malt whisky on the market today. Want to know more? 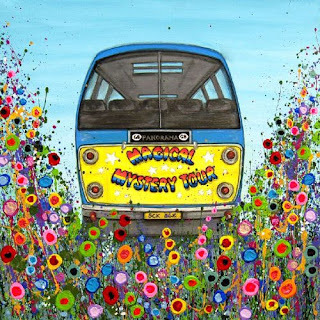 Hop on the bus. Roll up for the Mystery Tour ! John Hansell, editor of the American magazine Whisky Advocate, wrote that "India's Amrut distillery changed the way many think of Indian whisky – that it was, in the past, just cheap Scotch whisky blended with who knows what and sold as Indian whisky. 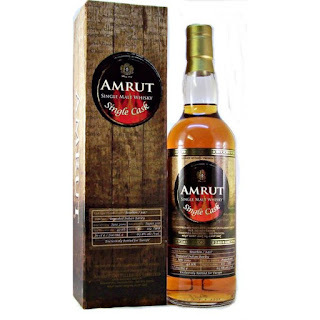 Amrut is making whisky, and it's very good". Pretty high praise. The company was founded in 1948, but didn't release any single malt whisky until 2004. Maturation in the Indian climate greatly affects the final product. The liquid lost to evaporation during maturation, the "Angels' share" in popular parlance, is higher in India (11–12% per year) than in Scotland, where the annual evaporative loss is about 1% to 2%. The master blender at Amrut Distilleries has estimated that one year of barrel-ageing in India is equal to three years of ageing in Scotland. Now I'm not sure if it's exactly that simple, but you get the idea. So seeing an almost 5 year old Indian whisky shouldn't put you off. Maturation is affected by a combination of factors: time in the barrel, interaction between the liquid, the wood, and the environment. This Amrut Single Malt, matured in an ex-bourbon cask, was an LCBO exclusive. It is the product of a single Cask (numbered 3443). A friend was kind enough to gift me a sample, but he didn't tell me what it was. He simply told me to contact him with my tasting notes and some guesses as to what I thought this whisky might be. This proved to be a fun experience and one I hope to repeat again someday. My tasting notes were based solely on my senses and not on what I thought I should taste, based on a label. The bottle was opened Dec 9, 2017, it was gassed after each use (a product called Private Preserve limits oxidation), and the bottle was 1/2 full when sample was poured April 20th, 2018. Nose (undiluted): no discernable peat at all, dates, raisins, nuttiness (walnuts), dark cherries, definitely seems like a Sherry Cask-matured whisky, a bit of dark chocolate, oak notes, brown sugar appearing after a few minutes. I was shocked when I found out that this was NOT an ex-sherry cask matured whisky. This leads me to think that there is a natural fruitiness in Amrut's distillate. Whisky writers love to argue about whether or not terroir is a thing when it comes to whisky, but I won't bore you with that here. It is worth noting that Amrut's ex-bourbon Single Cask single malt is distilled from Indian barley so maybe there's something to the "provenance affects flavour" argument. It is bottled at 60% ABV, so it is a belter of a whisky, but there aren't any bitter "spirity" notes to be found. My guesses were that this was a Macallan Cask Strength or an Aberlour A'Bunadh. I had heard about Amrut Portonova, and I guessed that this might be it, but my friend assures me the Portonova is quite different, though just as good. This was my first Indian Single Malt experience, but I can guarantee it won't be my last. If you come across one of these Single Cask offerings from Amrut, I highly recommend you pick one or two up. Absolutely fantastic.